What is the best way to relieve fuel tank pressure if the vent tube is blocked? This subject matter has come up multiple times (possible FAQ status) in the course of the on-line discussions of the International Ponton Owners Group (IPOG) and I thought the information might be useful to share with the global Ponton community. There is a good cross section of advice to Richard's original question. 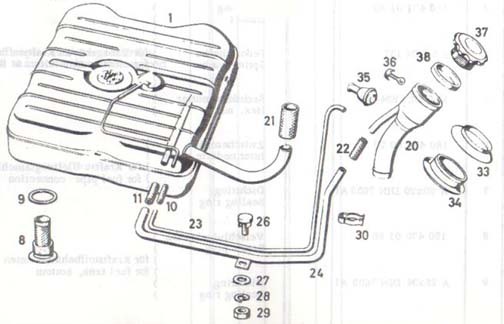 The Problem: The gas tank breather pipe, the tiny pipe which goes from the tank to above the filler cap (Diagram 1, Figure 23) under the locked door is blocked. It occurred to me that I should check it since the tank had been coated inside sometime in the past. I can force 120 lbs. of air pressure through it, but less pressure will not go through. I guess this is a pressure release for hot weather conditions to prevent pressure from building up in the tank and in the cold, prevent a vacuum. I have no way into the tank to find the end and open it. Would a 1/64th hole in the gas cap do as much good (and be functional)? The larger pipe (Diagram 1, Figure 24) is clear. That is the air escape for when filling the tank. I could possibly put in a "T" from it and run a hose up to above the filler where the original came out. But would fuel leak out through that hose? It is the vent tube's extension (Diagram 1, Figure 10) which enters the gas tank which is the culprit. You can pretty easily access the vent pipes and rubber hoses all the way to the tank. This little tube does not, to my knowledge, have any kind of valve to regulate air pressure. It is a direct outlet to the atmosphere. There is a small rubber piece at the cap end behind the movable mesh piece. Perhaps that has hardened and/or collapsed is such a way as to restrict air movement except when pressure is applied. I would posit, alternatively, that somehow the tube's inlet at the tank end (Diagram 1, Figure 10) may have gotten blocked when the tank was resealed inside. Can you drain the tank and disassemble this tube at the tank end and then clear it out? There must be atmospheric pressure maintained inside the tank because that is what causes fuel to be pushed to the fuel pump when its diaphragm is depressed. Fuel is pushed into the pump by atmospheric pressure in the tank, not sucked into the pump by pump operation. I had the same problem. When I removed my gas cap, there would be a loud pop as the partial vacuum in the tank was broken. Then one day the car quit because the fuel pump could not overcome the vacuum. If you can not unblock your pipe, you can loosen your gas cap just enough so it is not sealed tight or go for the tiny hole in the cap. It does the job. By chance I had an extra gas cap that had already been drilled with a 1/8th" hole. I enlarged the hole to 3/16ths" and then went to Home Depot and bought a white nylon screw, wing nut and appropriate washers. I then drilled the 1/64" hole part way into the nylon screw and then drilled across the threads and thru the first hole, forming a T-shaped air passage. This has worked for me. My 190Db had the same problem when I bought it over 25 years ago, though the tank had never been resealed as far as I know. The breather tube was badly clogged, but not completely blocked. I drove the car from San Francisco to San Diego to get it home, and at intervals of around 50 to 100 miles, it would quit, then after waiting awhile (for the vacuum to leak off), it would be fine. The previous owner had only been using the car for local trips in recent years, so he was probably unaware that there was a problem. Clueless as to the cause, I took it to a Mercedes mechanic I knew at the time. As I recall, he cleared the tube with a coat hanger wire. My opinion is that you should NOT drill the cap. The best solution is to take down the tank and fit new pipe and hose. First you should clean the pipe on the tank with welding wire. If you drill the cap you will have a gas leakage if you fill the tank up full. I had a Ponton with drilled cap once and I had this problem, but when I repaired the pipe and fitted new cap it was much better.